Black gloss finish blends into any environment! Transparent tempered glass case allows guests to observe exhibition on all sides! 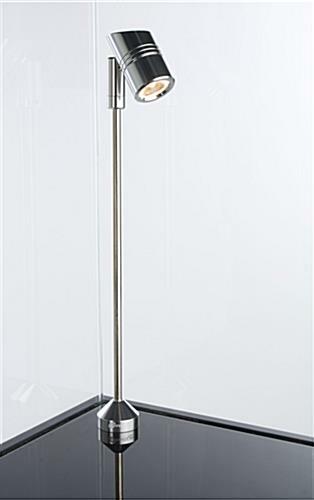 Warm color LED lights can be used to effectively spotlight the features of the item displayed! Base and drawer open and lock for convenient storage! 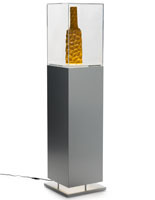 Pedestal ships assembled which reduces the likelihood of parts breaking or shattering. In a fast paced world, museum showcases that offer convenient features are highly valuable to any user and can prove to be worth more than the money spent initially! This time-saving design, which ships assembled, enables the user to unpack each individual shipping crate and begin to use these gallery stands almost immediately! 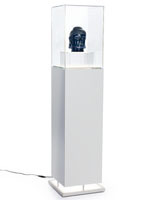 These pedestal stands, museum showcases, have additional storage space available in the base. Cleaning supplies, extra brochures, merchandise, money boxes and other necessary materials can be housed in the bottom. A movable 14-7/16"w x 9/16"h x 13-1/16"d shelf can be adjusted up or down and positioned at (1) of (5) different height levels to accommodate goods weighing less than 30 lbs! 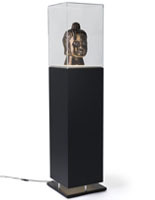 These museum showcases that can be used to protect and secure a collection of art design pieces are fabricated with (2) locks to prohibit customers, gallery attendees and other guests from stealing valuables that may cost a great deal of money to replace. 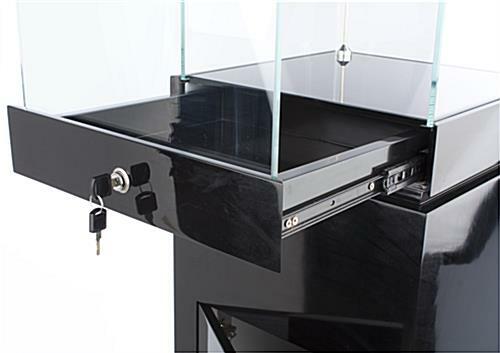 A hidden sliding drawer that locks is located under each glass box which provides another discrete place in this store fixture to store spare jewelry and accessories! These are transparent exhibition cabinets, national history museum showcases that can also be used to display science artifacts or products for sale in a gift shop! 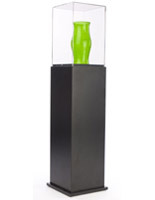 These attractive memorabilia holders are versatile and can be used in a number of creative settings! 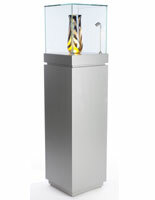 Quality museum showcases, like these high-end pedestal cabinets, are often times used in an art history gallery, jewelry store or national science exhibition hall to draw attention to the product on display! Dual LED lights are situated in the front corners of the case and each tilt manually to project a warm colored light on the exposed collection. 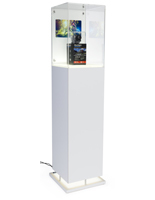 These attractive money making stands, museum showcases are used as a way to promote and sell new products. 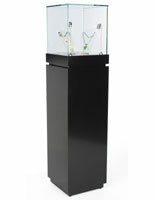 Customers who have purchased these store fixture glass cabinets value the features, design and noticeable effect in general product sales of that featured commodity! Black gloss museum showcases that add style to any gallery or fine jewelry establishment can alter the ambiance and transform the experience guests have within that particular space! There are (4) different finishes available for this particular model so please browse the assortment and order a collection of cases that harmonizes with the features of the anticipated setup location! 15.8" x 57.0" x 15.8"
14.4" x 41.3" x 13.3"
14.3" x 15.5" x 14.3"
12.0" x 1.8" x 11.1"